In WordFly you can browse to a list file (CSV, pipe-delimited, or tab-delimited file) on your desktop and import it. Easily import your subscribers from a CSV file by following these steps. If you're on a PC, the CSV format should be saved as "MS-DOS"
If you're on a Mac, the CSV format should be saved as "Windows Comma Separated"
Your CSV file name should not contain any special characters. Learn more. 2. Select Create an email list. 2. Select Import list from file. 3. Name your file and click Continue. 4. Select your file for import and click I'm done. Click Browse to navigate to your subscriber list file. Select the type of file you are importing (CSV, pipe-delimited, or tab-delimited). If you're a MAC user, you should see a message asking you to save the file as a "Windows Comma Separated" file type. Be sure to check the box "First row contains column names", this will help with mapping data fields in the next step of the import process. 4. Map your list fields to Data Fields that exist in WordFly. Click I'm done when you are finished. 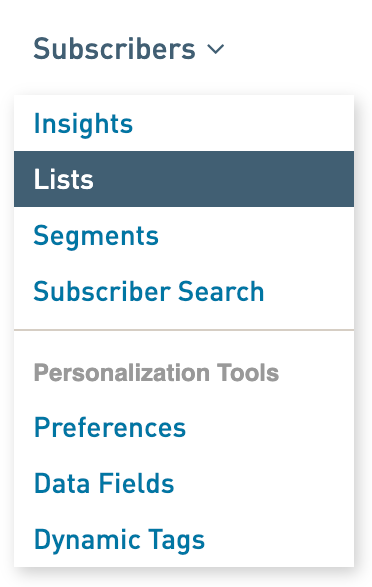 IMPORTANT: List mapping is critical if you plan to use data fields in your email template for personalization. Learn more. To map your fields select "Change" on the far right. Then in the middle column (WordFly Fields) select the appropriate data field from the drop-down that matches Your Fields data. WordFly will automatically map any previously mapped data fields. You must map the WordFly "Email" field before you'll be able to continue.